One of the most notable finds on the walk was the Ozark chinquapin (Castanea pumila). One specimen was growing on the westerly up-side of the trail just above the bluff over the lake near a large mass of farkleberry bushes (Vaccinium arboreum) covering the hillside The plant was mostly not alive with several six foot, dead branches still well attached in the soil and angling away from the two or three short (10-12 inch) living shoots that were putting out green leaves for the season. Ozark chinquapin is susceptible to the same fungal disease, chestnut blight, that has nearly exterminated the American chestnut (Castanea dentata) from North America’s eastern forests. 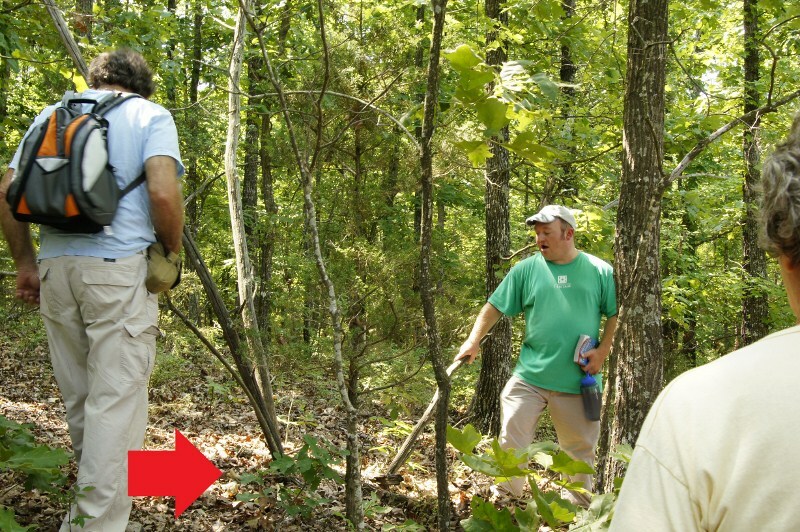 Brent uses walking stick to showANPS members where the Ozark chinquapin is growing along the trail. The red arrow is pointing to the leaves. The two miles of pressed gravel trails at South Fork wind around and over the 120 acre peninsula taking visitors along scenic bluff views of the lake and through a variety of ecosystems. Interpretive trail signs alert hikers to the ecology of the area as well as species of birds, insects, amphibians and reptiles, plants, and lichens that can be seen by the careful observer. The stone entrance to South Fork near Klondike Road is at a kiosk where information and pictures are posted alongside an enlarged map of the area. Hikers are always welcome to walk the trails at any time and inspect the 100 year old log cabin, the birthplace of noted folksinger Almeda Riddle. When the iron gate is closed (when there is no scheduled activity taking place) visitors may park in the lot opposite the gate. Enter at the kiosk and walk the trails. Bring your own drinks, since no water is available. Picnic tables are found at the cabin as are outhouse toilets. Visit the website (www.southforknaturecenter.org) for available details and information on activities and plant studies. Travel time from Little Rock north on Hwy 65 to Choctaw (just south of Clinton) and east on Hwy 330 to Klondike Road to South Fork is approximately one and a half hours. 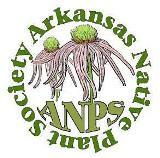 To view the previous article written about the ANPS field trip on May 19, 2012 click here. This entry was posted in Field Trips, Native Plants, Trees and tagged Castanea, Castanea pumila, Don Culwell, Gates Rogers Foundation, Ozark Chinquapin, South Fork Nature Center. Bookmark the permalink.